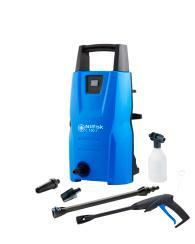 This light, compact and easy to handle Nilfisk high-pressure washer is ideal for basic garden cleaning. It offers a maximum pressure of 100 bar - which is enough to be efficient on mildly dirty surfaces. The automatic start/stop system along with an aluminum pump makes this a reliable product. Perfect for occasional cleaning of your patio, fence or other surfaces up to 25 m2/ hour. A handy helper for car, bike or garden furniture washing.